Steven Frankel is not hungry. He just wants to talk about noodles. Frankel is picturing a big bowl of noodles—and whether, and when, the noodles might loop back around on themselves—infinitely extruded, as they might be, from some sort of cosmic pasta maker. The noodles are a simplified way for Frankel, assistant professor of mathematics in Arts & Sciences at Washington University in St. Louis, to describe a link between the geometry of a space and the dynamics of that space—how the space changes over time. It's all part of his first solo-authored paper in the leading journal of his field, the Annals of Mathematics. Geometrists and dynamicists tend to form two separate camps in math, but Frankel prefers to think about these things in combination. And he isn't alone. In June 2018, he traveled to Shenzhen, China, to present some of his work as part of the International Conference on Dynamical Systems. "You can use some of the dynamical ideas to get some insight into the geometry of a space," Frankel said. "It gives you some way of breaking up a three-dimensional space into one-dimensional strands. And you can hope that if you can understand these one-dimensional strands, then you also understand how they fit together—to get some insight into your space." Picture a flow as a shallow sheet of liquid in motion. If you could identify a single molecule in that flow, and track how it moves over time, you can imagine building a kind of map that shows where the point went and when. If instead of moving on the surface of a sheet, the flow moved across a three-dimensional space with different geometric properties, you could still build a map of a point's location over time. But the map would would look different: The space would be filled up with strands or curves that represent the paths of each point—those noodles again. Frankel's new paper, Coarse hyperbolicity and closed orbits for quasigeodesic flows, proves a conjecture of Danny Calegari, the University of Chicago mathematician who was Frankel's former adviser and mentor. Calegari predicted that these flows would have closed orbits—meaning that some of them would necessarily flow back to where they started; Frankel did the heavy lifting to prove that it was true. "There's a relationship between these dynamical phenomena that appear—the stationary points and the recurring points, for example—and the large-scale structure of the underlying space that this dynamic structure is represented by," Frankel said. Frankel started off in engineering as an undergraduate at Cooper Union, but soon found his passion in pure mathematics. 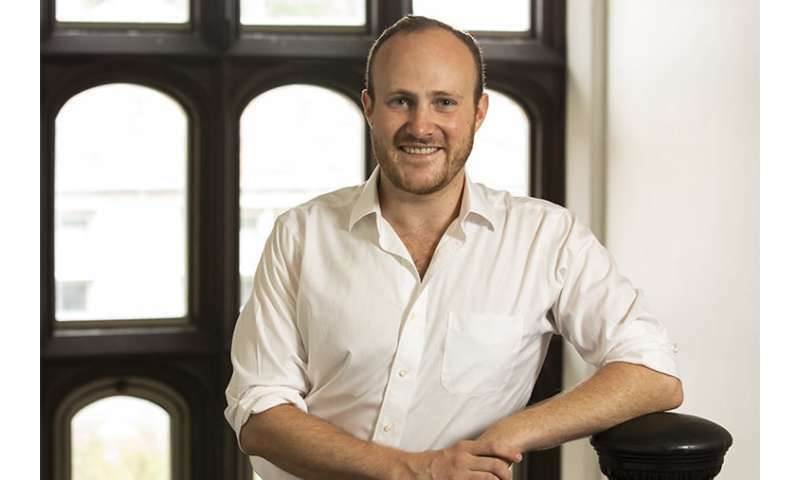 He completed his Ph.D. at the University of Cambridge in 2013, after following Calegari to the United Kingdom from the California Institute of Technology in 2011. Frankel then taught math at Yale University for four years. He taught his first class at Washington University in the fall of 2017. "Every student was fantastic," said Frankel, about the undergraduates in the upper-division course in graph theory. "Not everyone was a superstar. But, by the end, everyone was comfortable asking questions in the middle of class—and interrupting me when they thought I was wrong. "They were really engaged in learning," Frankel said. "I can't overstate how important that is. "There's this myth that learning mathematics is about memorizing a bunch of theorems and learning how to plug them together," he said. "The best way to learn is to have a question in mind—and to poke at it, and try to answer it yourself. And that requires a level of engagement on the part of the student that you don't find everywhere." Which brings us back to the pasta, and the key findings from his paper. "It's the silliest but still accurate way of saying what this paper says," Frankel said. "If you have a bowl and it's filled with noodles that don't bunch up too much, then some of those noodles have to form loops." But are the noodles linguine? Or rigatoni? "The thing with mathematics is that there are no obvious questions," Frankel said. "In mathematics, there are no obvious questions because you're not dealing with objects that are right in front of you." He is quick to point out the influence of previous generations, and also the current work of people around him in a department. "Mathematics is a community activity, not an individual one," Frankel said. "I can't just tell myself to sit in that seat and think. I can't instruct myself to come up with something interesting out of the blue. "For some reason, it's just the way our minds work. You need to be guided by something. The questions or conjectures that you find in mathematics—they may be interesting in their own right, they may be interesting because of where they lead you," he said. "It's just as much—if not more important—to find the right questions to ask, as it is to be able to answer those questions."